Watching the world go by - lining up your foreground subjects like that is great - puts us in their place, we see the scene before us through their eyes. this is like the movies, except real. The motion blur is fine in the background but incidental to the shot. 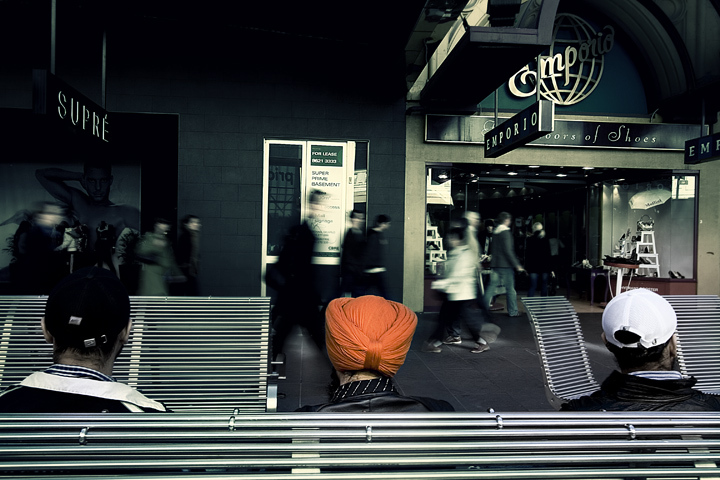 I'm fascinated by the three heads in perfect focus and the red turban in the middle. frikkin awesome dude. all these lines are trippin' me out. i think i'll stare at this forever... err something. Love the three's head gear, super image! Very unique...the opposing still and moving add a great tension to this. Cool photo! great work. i echo what everyone else has said. well done, indeed! they look like an audience watching the life pass by. the tones makes this even more interesting. brilliant work as usual. A very interesting photo with fantastic tones. One could read social implications in it too. Good shutter speed to get the sharpness with the blur in the background. The benches and seats help a lot with the horizonal flow of this image. the orange in the center is cool too, as it draws the view to the people moving above it. Proudly hosted by Sargasso Networks. Current Server Time: 04/23/2019 08:18:18 AM EDT.